I was lucky enough to be asked to do some live illustrations at the launch of Amelia's Compendium of Fashion illustration. Although completely nerve racking, I'm incredibly glad I went ahead with it (Amelia talked me out of backing down - thank you!) My illustrations were far from the standard I try hard to achieve (no seriously, I'm not being modest!) Thank goodness I had the time to edit it, and produce something I felt comfortable sharing, over the weekend! The first illustration can be seen on this article about the night by Matt Bramford. 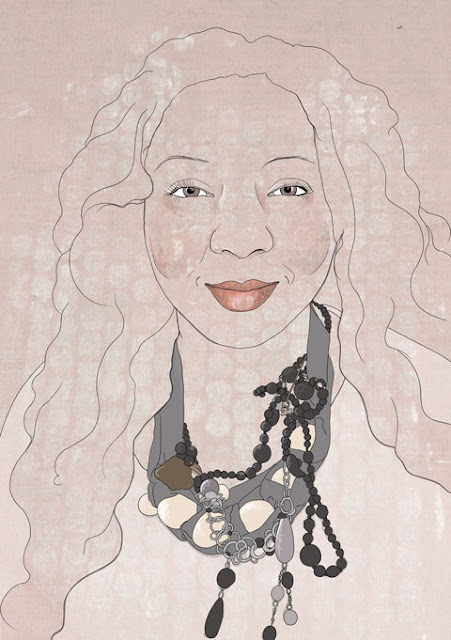 The illustration shows the lovely Ashanti Jason, otherwise known as Adorngirl. She was a pleasure to meet and was wearing the most amazing necklace! There are many more illustrations to come, so keep an eye out! This looks fab - I love it!